Turnabout Day arrives in just a few days, on August 22, and as we continue to celebrate my blog’s Jamaica Month, I wanted to share one of my favorite parts of Jamaican culture — the proverbs. My mom and grandmother were famous for passing along a little island wisdom every now and then, and as crazy as these sayings seemed to me when I was younger, their logic is apparent to me as a grown woman. Try these on for size and see if you can appreciate the truth in them. 1. Sometimes the cheapest comes the dearest. In other words, sometimes the effort to save money can cost more than just spending the extra money in the first place. Consider Tupperware as an example. It’s easy to balk at how much Tupperware costs, but I have Tupperware pieces that are older than I am. That grocery store stuff might be cheaper, but you’ll make up the difference when you have to replace it every few weeks. The same is true of shoes, purses, and that Burberry trench coat you should go ahead and buy. 2. Puss belly full, potato have skin. When the cat’s belly is full, she notices that potatoes have skin. I have a true story to use as an example for this one. One of my little cats used to live outside in the parking lot before I adopted her. Back then she used to eat whatever she could find, especially near the Dumpster. I think this is where she acquired her love for french fries (although I think it’s unAmerican to throw out perfectly good french fries). Now that she lives inside and doesn’t have to scrounge for food in the garbage, she’s developed certain preferences with regard to her fries. Specifically, she only eats the ones from McDonald’s. She will actually turn her nose up at Five Guys fries because of the skin. 3. Man meant fi hang cannot drown. This one’s about destiny. If you’re meant to hang, you can’t drown. It sounds a little morbid, but I actually find it kind of reassuring. After all, when your number is up, it’s up, but until it’s up, there’s no sense to worrying about things. And here’s one for my upcoming story, “Turnabout Day”: What never happens in a year, can happen in a day. Expect the unexpected! It only takes an instant to change everything. See, Chloe Newton, the heroine of my story, figured she’d never see her childhood playmate, Peter Darrow, again once he left Jamaica to return to Scotland. But years later, he’s back and ready to help her repair the fleet of steam-driven cane cutters that work her estate’s fields. Plus Peter’s hot now. Yeah, kind of a complication when you’re trying to keep it businesslike and all. 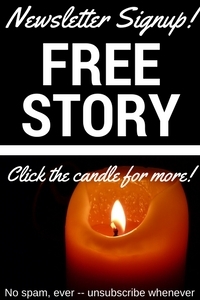 The story takes place on Turnabout Day, a holiday when the upper class serves the servants. Chloe seizes the opportunity to … well … seize Peter, and hot hijinks ensue. Check it out. She reached for his mouth, wanting to stroke his full lips. He intercepted her hand and pressed her fingers together almost painfully. His promise, his desire-laden voice, made all her empty places ache, and she sighed. He slid his hands down her bare arms. He leaned down toward her, moving with a torturous slowness, and she pressed her lips to his. Her skin burned where it met his. The smooth, soft surface of his generous mouth teased her. Need erupted in her, and she fought the desire to wrap her arms around him. She pulled him to her and kissed him hard, the way she’d wanted other men to kiss her. She locked her mouth to his, but she’d only begun to ease his mouth open when he parted his lips for her. Then he took control, his tongue eagerly taking possession of her mouth. So what happens next? You’ll have to wait a week to find out! I’ve decided that this August is ‘Turnabout Day’ Month, which sounds a little weird if you say it out loud. In honor of my upcoming release, a short story set in Jamaica’s steam-driven alternate history, I’m going to hit you up with Jamaica-themed blog posts all month long. And because I’m sure you thought I forgot last month, I’m going to start with a Jamaica-themed Swirl of the Month. This month, we’re going to celebrate Grace Jones and Dolph Lundgren. 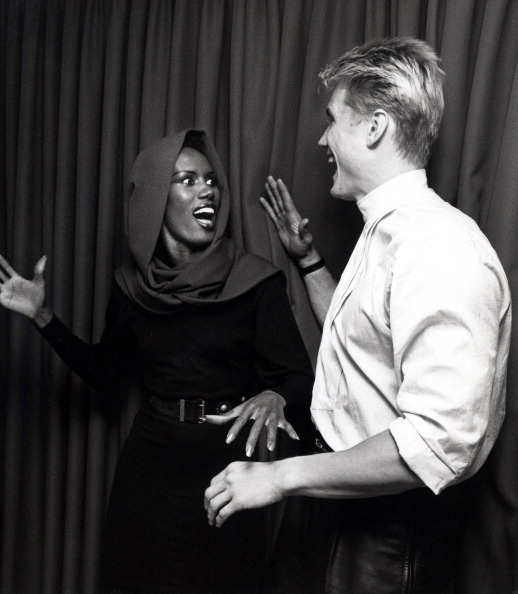 Grace Jones and Dolph Lundgren were only together for four years. Dolph, now in his 50s, still speaks of her fondly. Here’s just a touch of trivia for this striking couple. He got into the movie business when visiting Grace on the set of A View to a Kill; when one of the extras didn’t show up, the director went looking for volunteers. Grace is a preacher’s kid (well, of course, she is) from Jamaica. Dolph’s from Sweden and studied chemical engineering at MIT. Grace performed at the Queen’s Jubilee celebration a couple of years ago. She sang one of her songs (“Slave to the Rhythm”) while hula hooping. That’s eight minutes of hula hooping, neighbors. She had her mic in one hand and a pair of finger cymbals on the other, and she started the hula hoop up the way that most of us put on our pants. Most of us remember Dolph as Ivan Drago in Rocky IV (he had to break Rocky, remember?). He also gives a terrific interview. Check him out here with Men’s Health. Sugarcane heiress Chloe Newton said goodbye to indentured servant Peter Darrow with her first kiss, on a hillside one long-ago summer night as mechanized cane cutters worked the fields below them. Now Peter’s returned, no longer a boy and no one’s servant, to take charge of the fleet of machines that work Chloe’s estate. On Turnabout Day, Chloe takes on the uniform and duties of a maid, and she seeks the courage to offer Peter more than a celebratory drink. By giving in to his commands, she’ll surrender to his need and become mistress of her own desire. Get ready for this touch of Jamaican heat on August 22 from Musa Publishing!